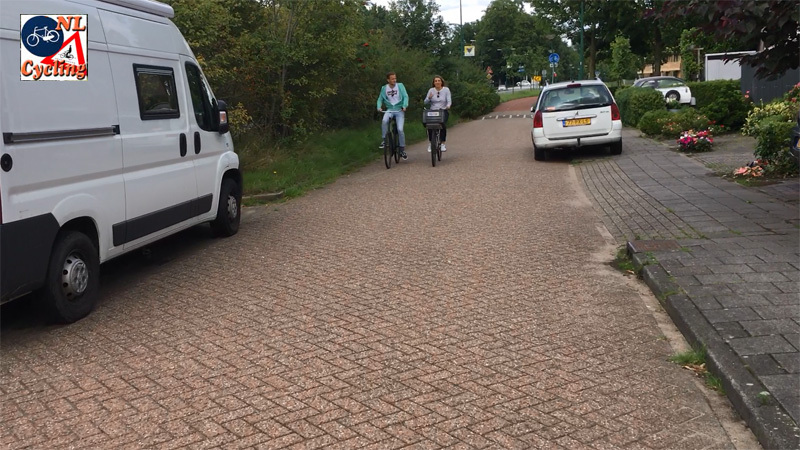 The F28 Fast Cycle Route from Utrecht to Amersfoort is currently under investigation. In today’s post, I will show you what the possible route looks like now. That’s right, I am going to show you the before state of a new fast cycle route without any actual work done yet on the ground. This project is still in its very early stages. The very first newspaper article I found about this route was only published on 29 August last; nine days after I filmed my ride. Parts of the future F28 fast cycle route are currently of an older type of cycling infrastructure that would need updating. 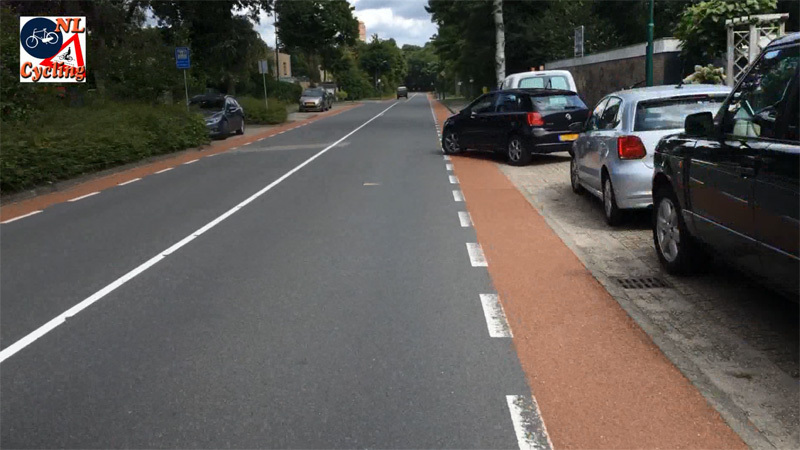 This cycle track in Bilthoven would at least need a smooth coat of red asphalt. 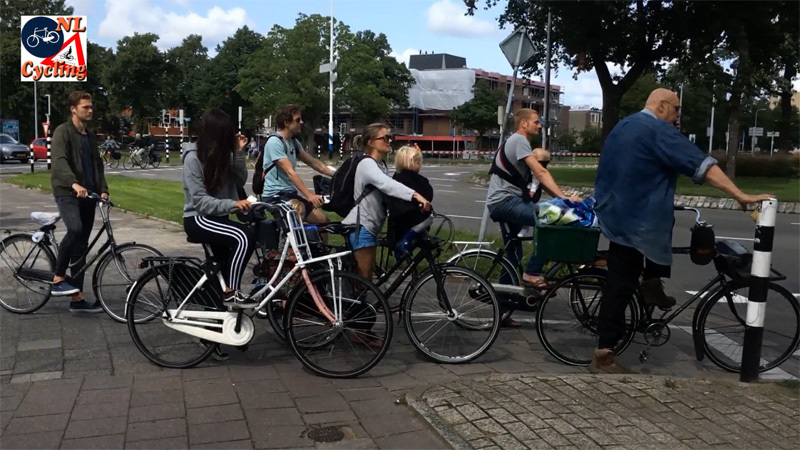 The province of Utrecht would like to connect its two largest cities, Utrecht and Amersfoort, by a high-quality cycle route that would make it possible to cycle the 18.5-kilometre route almost non-stop. At the request of the province Loendersloot Groep consultancy have written a plan to study the feasibility. I was allowed to study the proposed route. It starts in the north-east of the city of Utrecht and then also goes to the north-east. That is an area that I am very familiar with, because this is where I grew up and spent the first 30 years of my life. I have cycled so much in this area when I was younger that one look on the map made it possible for me to cycle the entire route without having to look on a map again once. That is not only because I know the area so well, I hadn’t been to some of the route for at least 30 years, but also because this proposed route is very intuitive. Well, at least for an ex-local it is! I filmed my ride with a new app that one of my readers recommended. That means the images are much more stable than what you are used to, even at 6 times normal speed. But there was a down side too. The app had trouble adjusting the lighting and the route runs through some very sunny parts and some very dark parts under the trees. It meant I had to stop often and re-adjust the lighting manually, every time the lighting was too different. As you will see in the video, the route is already remarkably good. You could already use this as a fast route, but of course to make it a high-quality fast cycle route a lot would still have to be done. Let’s look at it from municipality to municipality with some pictures to explain things. For the time being the beginning of the route is set at the north-east corner of the old city centre. From there a 4-metre-wide bi-directional cycle path starts. That is already the right width. 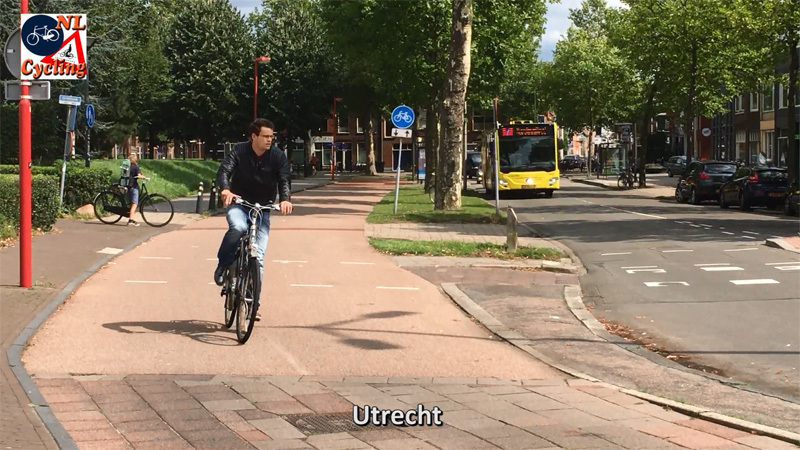 Where the route is not up to standard, it will be very soon, because it coincides with the route to connect the Utrecht University area with the North of the city. That means Utrecht will not have to do much extra work. Some bollards on a bridge would have to go and there are five sets of traffic lights that would need to be adjusted so they would be friendlier to cycling. Apart from that, Utrecht is already pretty fine. Start of the route in Utrecht at the north-east corner of the historic city centre. 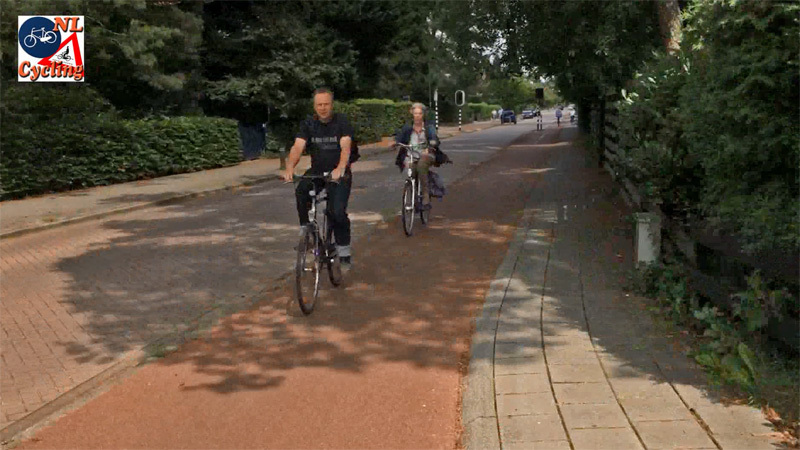 This cycle path is already at the desired 4 metre width. Even with the right width, bollards such as this collection are unacceptable on a fast cycle route. 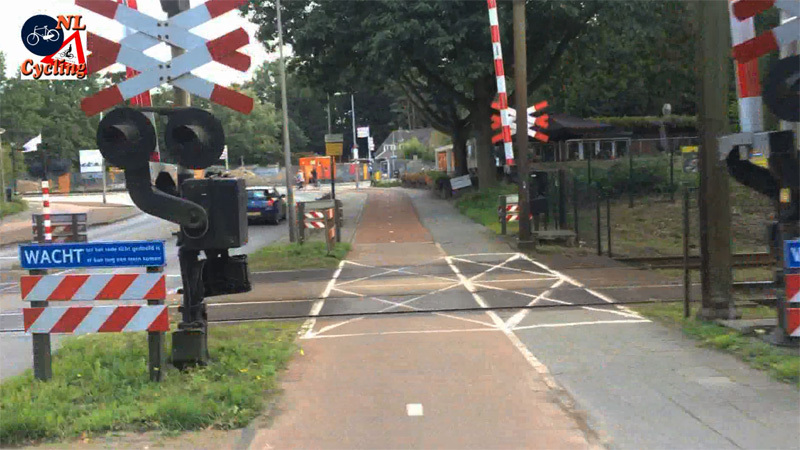 Some traffic signals hold up cycling, such as here. That so many people are waiting here must mean the wait was long. Too long for a fast cycle route. That means the phasing for the lights should be made more cycle friendly. This part of the route in Utrecht will become a fast cycle route to the University Area. As such the city has already determined this infrastructure will be upgraded to the highest cycle standards. The municipality of De Bilt (formerly Bilthoven) carries the longest part of the route and I think it has quite a few issues. The total of all the different types of infrastructure works a bit messy. The route should become a whole much more than it is now. A residential area needs to become a cycle street with red asphalt instead of pavers. 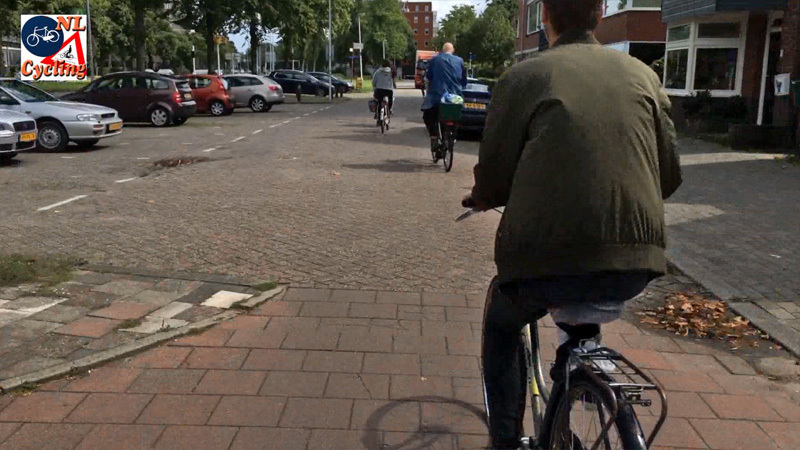 There are a lot of narrow one-directional cycle tracks with a type of ‘Armadillos’ right next to them which are too dangerous. The narrowest part of the entire route is also in this municipality. This is a bi-directional path of just 1.93m wide. That is a lot below the required width of 4 metres and can’t stay this way. I saw two people coming towards me there and I thought they were going against traffic. 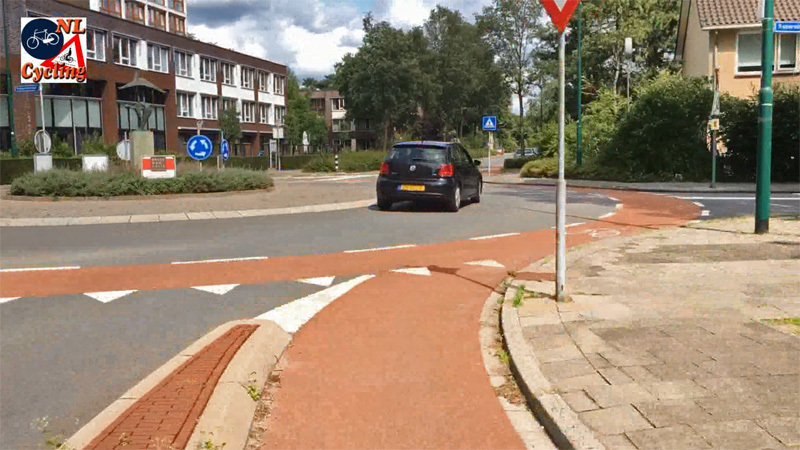 The town of Bilthoven also has a roundabout that is too small. Fortunately, the street that needs most work, because it has on-street cycle lanes now, is already on the list for a complete makeover. This residential street will have to be transformed into a cycle street with smooth red asphalt. At first glance this one-way track may look quite well already but the two concrete barriers (“Armadillos”) on the left hand side are too dangerous for a fast cycle route. 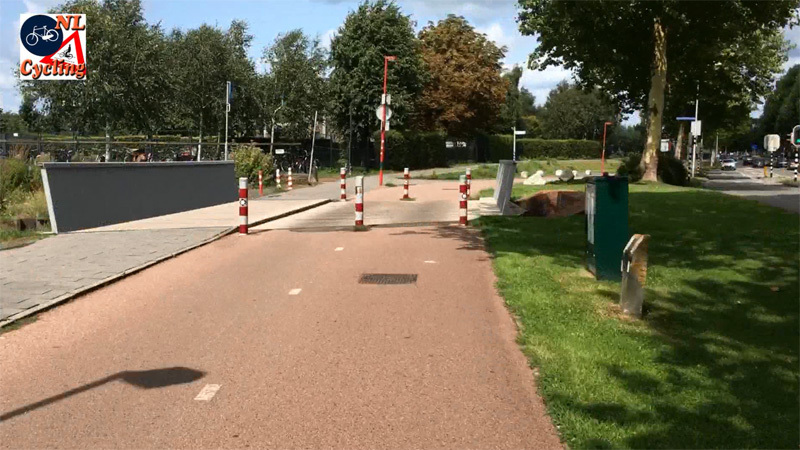 These barriers are found all over De Bilt and Bilthoven and should be removed. 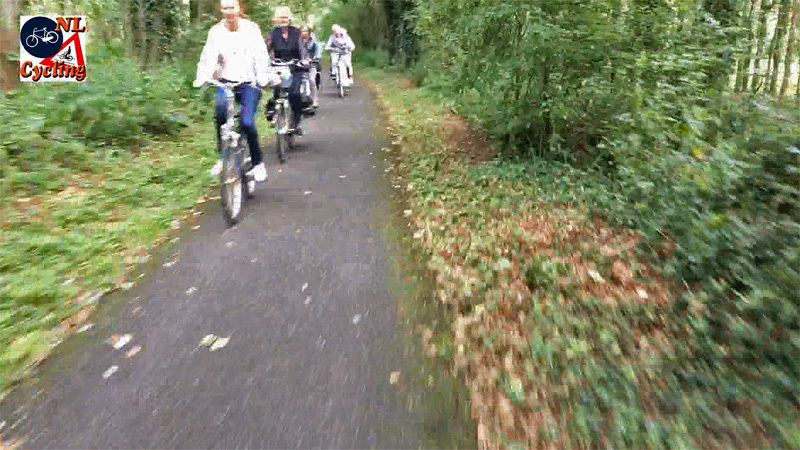 A short part of the route is on the already upgraded fast cycle route from Bilthoven Station to Utrecht University. This could be what most of the entire route will look like one day. The dimensions of this roundabout are too small. This makes it unfit in a fast cycle route. This street will be completely reconstructed. That is very good, because in its current state it could never be part of a fast cycle route. This is the narrowest bi-directional cycle path I know. I genuinely thought these people were salmoning, which they are not. This track is only 1.93 metres wide, which is narrower than the standard for a one-way cycle track! Needless to say that this should be changed. Although the route through this municipality is not too long, a lot needs to be done in the town of Den Dolder and the route is also not certain yet either. It could either go north, directly past the station of Den Dolder, but only if it is decided that the level railway crossing there will be closed to motor traffic. If that is the case you can have a fast cycle route there. If not, the south route is preferable. That is the alternative I filmed. 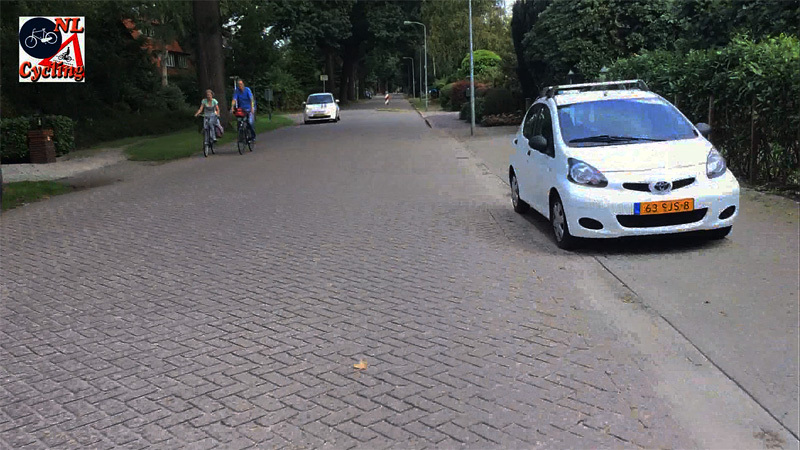 But that route runs through residential streets with pavers, without any cycling infrastructure right now. 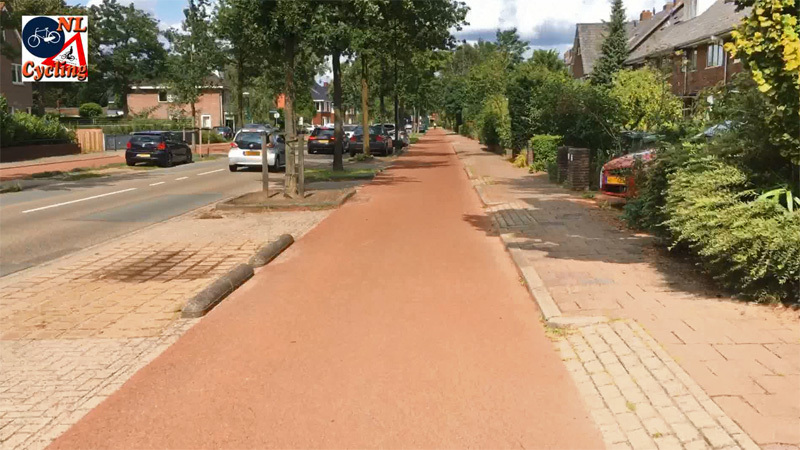 The first part would get one-way 2-metre-wide cycle tracks with smooth red asphalt on either side of the street. Other streets in this municipality could become cycle streets, because the motor traffic volume there is low enough. The solitary cycle path (which means it does not run next to a road for motor traffic) running parallel to the railway, is very narrow, so it would have to be widened. The municipal border between Bilthoven (part of De Bilt) and Den Dolder (part of Zeist) is clearly visible here. The separate cycle track with smooth asphalt becomes an on-street cycle lane with pavers. The sidewalk simply stops. For the fast cycle route the asphalt must continue. For this street to be a good part of a fast cycle route, it could get 2 metre wide separated one-directional cycle tracks on either side with smooth red asphalt. There is more than enough space to build that. This purely residential street should become a cycle street. 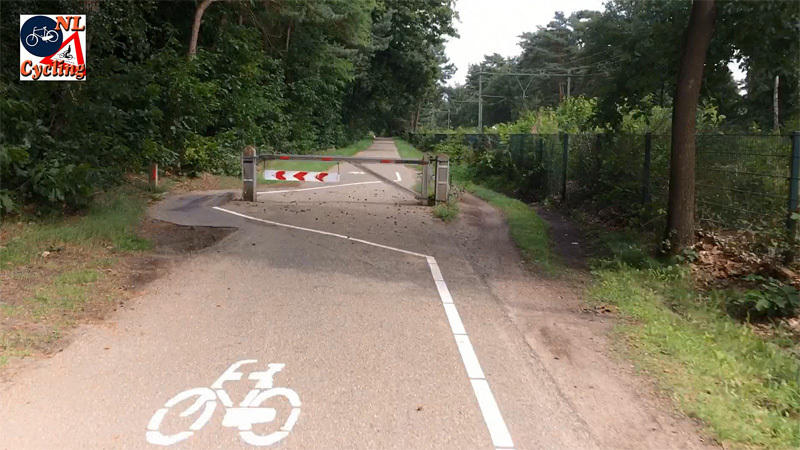 The municipality of Zeist would have to widen this path in the forest, parallel to the railway. 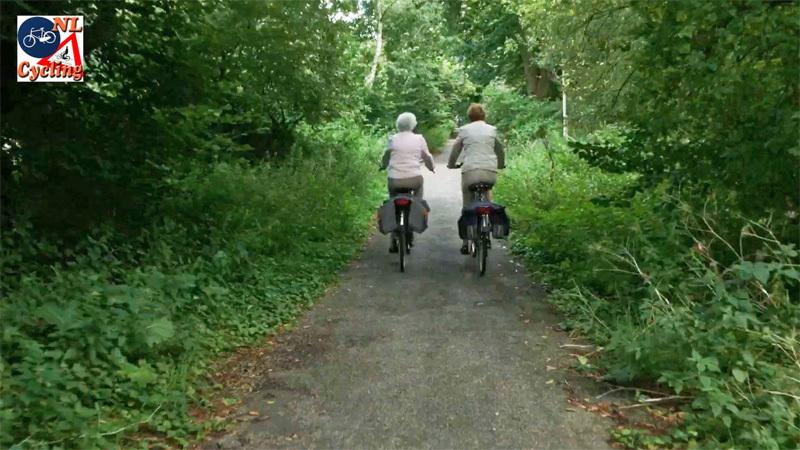 As these older ladies demonstrate, it should be at least twice the width for a high quality fast cycle route. This municipality also carries a long part of the route, most of it through the woods. There are two problems here. The first one is that the path was renewed very recently, but at a width of 3 metres. That means it is not meeting the high-speed cycle route standards, which is an interesting challenge to deal with. More pressing is the fact that the cycle path is now only accessible in daylight. Even though this is a nature reserve, that could not stay this way. In wintertime both the morning rush hour and the evening rush hour take place in the dark in the Netherlands. It would be unacceptable to have a part of the fast cycle route that could not be used in rush hour part of the year, so this must be changed one way or another. Quite easy to remedy are two gates to keep out unwanted car traffic, which are very unfriendly to cycling now. Those gates should be replaced as soon as possible, even if the route would not go through as planned. 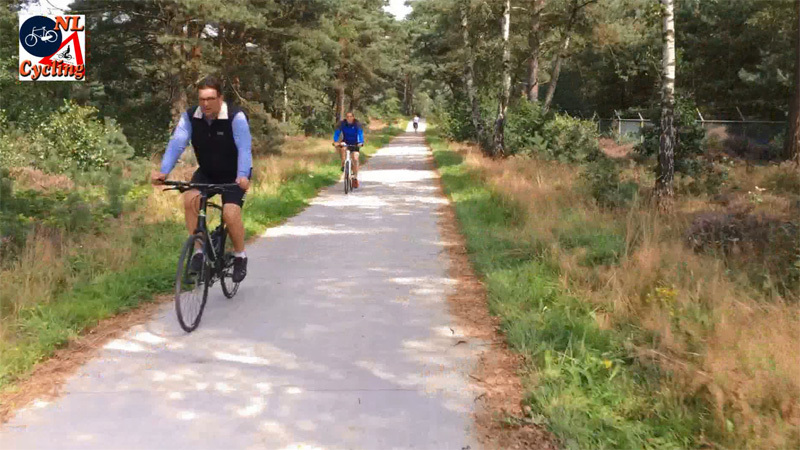 The full length of this cycle path in the woods of Soest has been upgraded in white concrete. Unfortunately at 3 metres it falls just short of the required width of a fast cycle route, an interesting challenge. It should be made legal to use this path in the dark, this is currently not allowed. Such an unfriendly gate to keep cars out is unacceptable on a fast cycle route. This gate and the other one just like it should be replaced by something else as soon as possible. The route through Amersfoort – one of the name giving municipalities – is the shortest stretch in any of the municipalities. It is just one kilometre and it will become even shorter: 150 metres shorter. 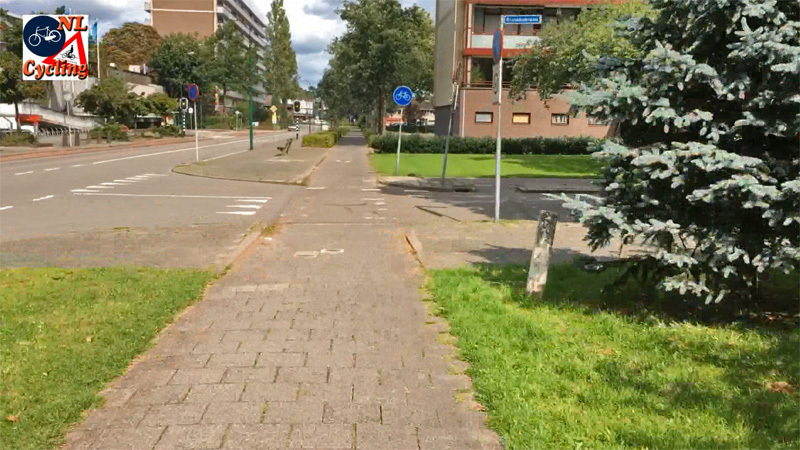 Apparently the city of Amersfoort has decided the route ends where the forest path meets the first road in Amersfoort. That road will be shifted south by 150 metres and the current level railway crossing will be transformed into an overpass. The future fast cycle route should end at that future overpass that will also make cycling possible over the railway. Of course, it is already possible to cycle from there to the city centre and I did indeed cycle all the way to the station of Amersfoort. The video shows that most of that route is already at a very good standard. This narrow path in the woods would also need to be double the width. To be able to keep as much trees as possible and to make the route attractive it could be nice to have two one-directional cycle paths winding through this forest. Not part of the proposed F28, but the route could continue here. This level railway crossing will be replaced by an overpass for road traffic about 150 metres south of this location. 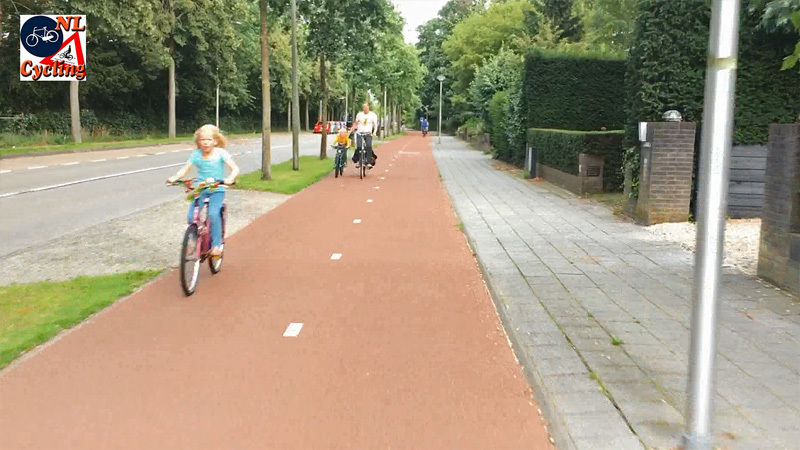 The ‘ordinary’ cycle ways in Amersfoort are already of the highest quality. This is the extra distance I cycled to the railway station. A route like this will not be executed as one big project. Usually the different municipalities are expected to tackle their “problem areas” one by one. If all goes well, the newspaper article reveals that that could happen in the period between 2018 and 2020. I am already looking forward to being able to film the after situation in three years’ time! Often when I make longer tours, an interesting mapping may appear a few days later on Twitter by Jitensha Oni. These maps are so interesting that I re-tweet them and even ad them to the post. But I feel the maps deserve an even bigger audience. So this time I gave the bicycle devil the opportunity to see this post ahead of the publishing date. That means I can include the map right away from the beginning! Enjoy the always interesting statistics that are the result of a study of my video and the route on Google StreetView. Mapping of the before state of the possible future F28 Utrecht-Amersfoort by Jitensha Oni. 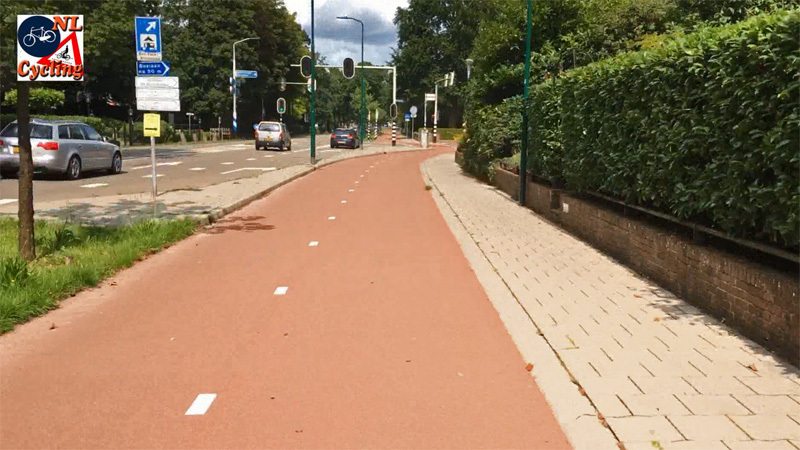 The province of Utrecht and the municipalities of Utrecht, De Bilt, Zeist, Soest and Amersfoort gave the go-ahead for the realization of the Utrecht-Amersfoort express bike route on Wednesday afternoon March 13th, 2019. More information (English). This municipality also carries a long part of the route, most of it through the woods. There are two problems here. The first one is that the path was renewed very recently, but at a width of 3 metres. That means it is not meeting the high-speed cycle route standards, which is an interesting challenge to deal with. More pressing is the fact that the cycle path is now only accessible in daylight. Even though this is a nature reserve, that could not stay this way. In wintertime both the morning rush hour and the evening rush hour take place in the dark in the Netherlands. It would be unacceptable to have a part of the fast cycle route that could not be used in rush hour part of the year, so this must be changed one way or another. However, I have also watched a video where there is this dynamic lightning integrated in to the ground and when I cyclist is detected a certain section is lit then. Here are some examples of dynamic lightning for cycle paths. We only have to think about which type of lightning will be better. Lightning on a post or integrated in the ground. Personally, I would prefer lightning on a post, as shown in your video with the possible solution. Because, the light that suddenly turns on could scare animals away from the bike path. Hence, elimination of a possible collision with an animal. Which people are already riding the route between Utrecht and Amersfoort? And which people is the municipality of Utrecht wanting to encourage to ride the route? Are there are lot of workers or students in Utrecht who live in Amersfoort who would use the route? Just to contrast I can give an example of this process in the UK. A new port was built in the last few year along a canal west of Manchester, and as part of an agreement for the company owning the land to build the project they agreed to part fund a 1m route about 2 miles long allowing workers to cycle to the port, reducing the impact of traffic by the new development. The other part of the funding came from a national fund that individual cities have to apply for and that expires after a few years. Therefore it stands on its own rather than linking into a long-term network. The route has a comfortable surface but the money only goes so far. There was not enough money to light the route, at most there might have been solar nubs pushed into the surface, and it aims to be only 3m wide where possible. There are also some connections to the route left as cobblestones or simply mud. However it’s also clear many locals are enjoying the route. However since being started about two years ago, it will take a further extension to reach the port. Why not use the infrastructure of the N237? I don’t know the exact reason in this particular case, but in general people don’t like to cycle next to fast moving traffic for a longer time. (Noise, pollution etc). This route is mostly away from motor traffic, which also means fewer conflict points with traffic entering and leaving such a main motor traffic route that you would have when a cycle route runs parallel to it. @Hermannus If that were the case it would be renamed to F237. This hypothetical F237 has the problem the N237 has many big intersections with traffic lights which will cost time. Besides of that it has the noise/pollution problem which makes cycling really exhausting over there. However, the F28 has its problems too. 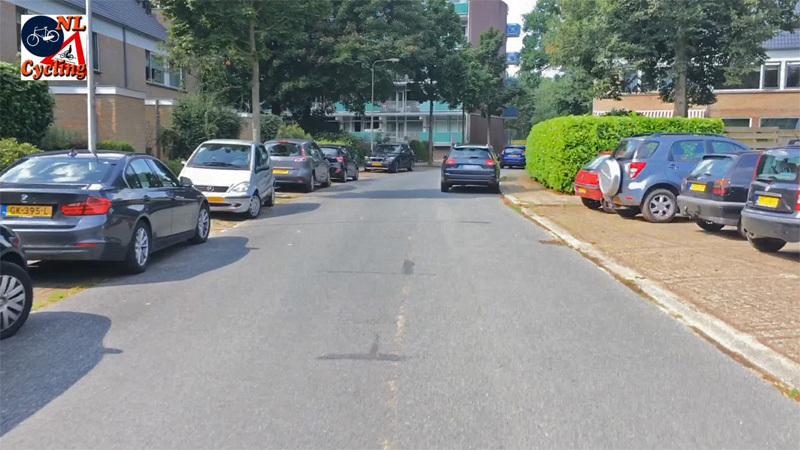 Completely not straight-forward in De Bilt and Bilthoven and it has to go next to the (former) military base of Soesterberg. 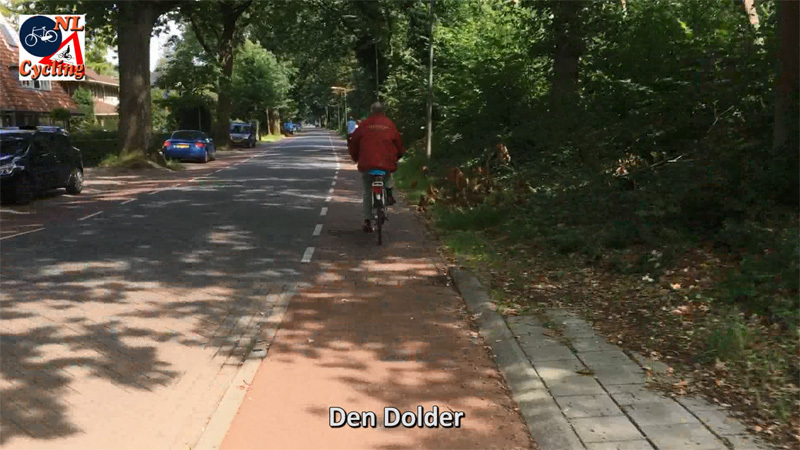 It is private property (owned by Het Utrechtse Landschap) so they decide whether if they want a fast cycle lane or not. Probably not, because most nature parks here close at night to protect the animal’s rest against the noise of mopeds, music and street lights and also to prevent shady business over there such as dumping XTC waste. So maybe the F237 (or this https://goo.gl/maps/mmShCuF5s9z ) isn’t that bad to give it a try with some extra measurements against all that noise. But Provincie Utrecht has been working on grade-separating several of the intersections of the N237, at least in the area around De Bilt. They’d only have a couple places left with conflict points, certainly not unmanageable. As usual, the Dutch “before” would put most American “after” to shame. Can’t wait to see the finished product! 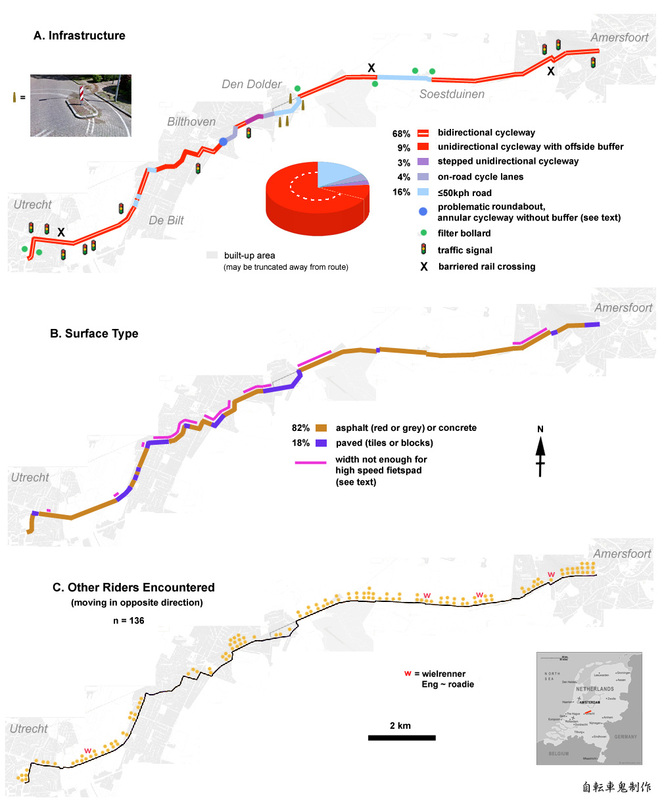 I can’t quote cost yet, but the general rule of thumb is €1 million per km of brand new high quality cycle route. So for $100 million you could have about 5 of these routes. The Dutch see the cost of this type of infrastructure relative to the cost required to build car-related infrastructure. As such, this sort of project is often seen as cheap in comparison. 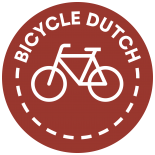 This entry was posted on 12 September 2017 by Bicycle Dutch in Original posts and tagged Amersfoort, Bilthoven, cycle superhighways, De Bilt, long distance cycle paths, Soest, Utrecht, Zeist.